Engineers designing space-bound satellites and solar arrays face a rather ironic challenge — lack of space. 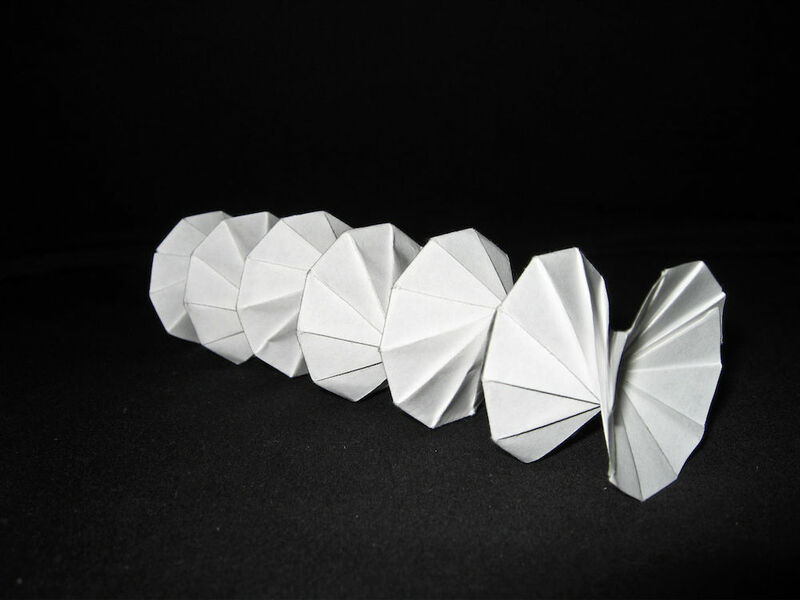 In order to overcome this problem, aerospace engineers are turning to an interesting source for inspiration: origami, the ancient art of Japanese paper folding. There are a surprising number of modern-day engineering projects that take advantage of origami to solve design challenges, such as the self-deployable stent, designed by Kuribayashi et al., or the origami-inspired Eyeglass Telescope, designed by the Lawrence Livermore National Laboratory (LLNL) with help from origami artist Robert Lang. As an amateur origami aficionado, I was intrigued to learn about the various ways engineers incorporate this ancient art into their designs. Origami model called “Spring Into Action”, designed by Jeff Beynon and made from a single rectangular piece of paper. 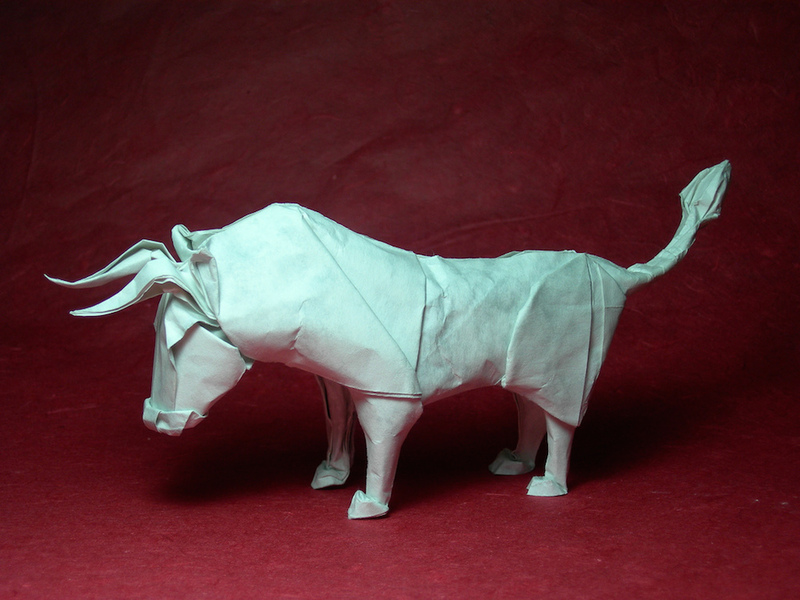 A bull, wet-folded from a single sheet of paper. One such project that caught my attention is currently being conducted by scientists at NASA. The group is using origami techniques to optimize the packing and deployment of solar panels and other large objects shipped to space. For decades, space solar power (SSP, also called spaced-based solar power, SBSP) has been the topic of many research papers and, of course, featured as the highlight of many sci-fi novels. However, it was not until recently that the potential for such a renewable energy source has become a reality. 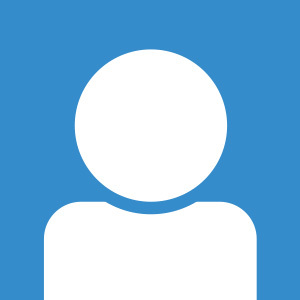 Recent advances in wireless power transmission, as well as the growing global concern for the environmental effects of greenhouses gases, has led to a renewed interest in SSP. Whereas wind farms and land-based solar arrays occupy large amounts of land, current designs for SPSs (solar power satellites) would only require a relatively small rectenna to receive and convert microwave energy into DC electricity. In addition, SPSs can collect energy without losses due to atmospheric absorption and can be active for 24 hours a day (as opposed to the 12 hours a land-based array can collect the sun’s rays for). These factors, among others, make SSP by far the largest potential energy source yet proposed. While implementation of the first SPSs may still be a long way off, origami techniques are being used to help engineers at NASA and other organizations to figure out a way to ship the large, fragile solar arrays into space. In the paper “The Solar Umbrella: a Low-Cost Demonstration of Scalable Space Based Solar Power“, researchers at NASA’s Jet Propulsion Laboratory (JPL) explore the feasibility and cost of building and deploying a solar power wind farm in space. Shown in the image below is a depiction of the solar umbrella as it expands to its full width after being launched into orbit. Transmitting Antenna Deployment via Thickness Accommodating Origami-Based Flasher Model. Taken from the paper “The Solar Umbrella: a Low-Cost Demonstration of Scalable Space Based Solar Power“. When discussing the solar umbrella in a recent interview with National Public Radio (NPR), the researchers mentioned the Miura-ori (ori means fold), a famous origami fold that was invented by Japanese astrophysicist Koryo Miura in 1970 (click on the NPR link to see a video example). The fold was later used to design a solar sail that was launched into space on Japan’s Space Flier Unit. With the Miura fold, you can take a large piece of paper and fold it into a small space and — most importantly — reopen it in one movement. For space-bound solar panels, this means that only one motor would need to be used for deployment. In the solar umbrella shown above, a variation of the Miura fold was used to create the design, allowing the 25-meter diameter solar array to be stowed in a space just 2.8 meters by 4 meters. Space-based solar power was explored in the recent IEEE Spectrum article “How Japan Plans to Build an Orbital Solar Farm“, where you can read more about the Japan Aerospace Exploration Agency (JAXA) and their designs for an SSP farm.